There are lot of subtle ways to construct a successful marketing email but in general terms they are nearly always a mix of text and images. There’s good reason for this as the immediate impact of imagery is often enhanced by the context created by compelling text and vice versa. Still, there are significant and compelling reasons to favour one structural form over the other. Images create an instantaneous appeal to the senses. The right image conveyed to the right person can be rapidly emotionally evocative in a way that text needs to work towards. As images have become more prevalent through social media we can see examples all around us of pictures that can spur is into action or create needs we didn’t know we had. That kind of power, if harnessed correctly, can help your business. Images can tell a story without words and the right story, one as simple as ‘imagine how good you would look in this coat’, can turn a reader into a customer. Of course, the downside comes in choosing a boring or incorrect image, which can have the reverse effect – squandering interest and turning off potential customers. While images can have a startling effect text enables a more subtle lure. A well-crafted piece of prose can create a context and a reasoning for a client in a way that an image cannot. Text appeals better to reason and it is reason that often rules the purse strings. A powerfully worded paragraph can create both a need for products or services as well as the rationale for why such products or services are suddenly necessary. Text is also a great way to create informative articles and other pieces that create added value for your brand in the eyes of customers. 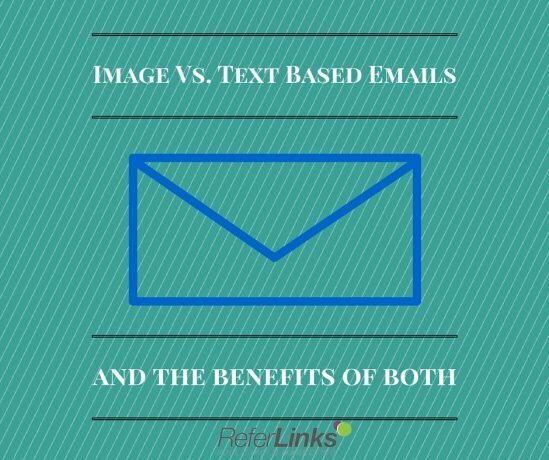 Choosing whether to structure an email around images, text, or a both is a decision based on your target demographic and the content you want to convey. It’s not always an easy call and expert guidance can be of great benefit. ReferLinks FCM can provide that guidance as well as the skill and experience in creating both compelling imagery and persuasive words. Contact us today. This entry was posted in Email Marketing and tagged Benefits of Images,Benefits of Writing,Email Marketing Trends on November 11, 2015 by ReferLinks Online Marketing.